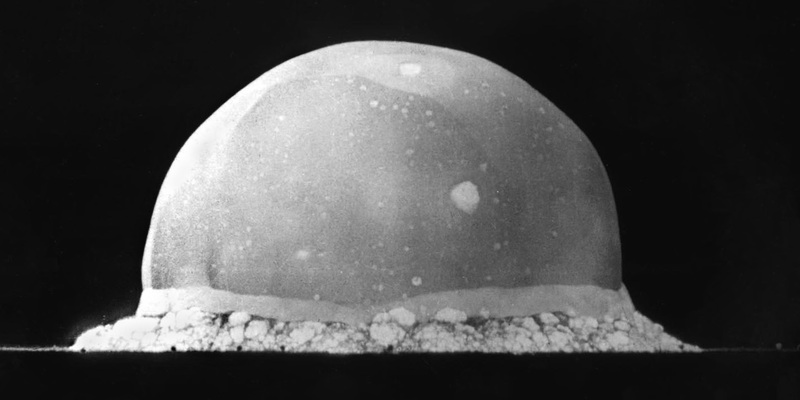 It just occurred to me that almost all images I've seen of the (in)famous mushroom cloud show a vertical column rising perpendicular to the ground and a horizontal planar ring parallel to the ground. Not that I'm an expert (that's why this question) but I have rarely seen anything go in the 45 degree angle. Or for that matter anything other than the 'special' 0 degree horizontal plane and 90 degree vertical column. Shouldn't there be radial vectors at all angles between 0 and 90 degrees giving rise to a hemispherical explosion envelope? Why is it a vertical cylinder? PS: I understand the top expands eventually on cooling and lowered air pressure giving the mushroom look but my questions is for the previous stage - the vertical column. The gas cloud that you posted, and what many would consider is synonymous to the nuclear weapons, comes after the explosion. Nuclear bombs are actually usually ignited above ground for "maximum destruction." Since the nuclear reaction is immensely hot (about 4000 K whereas the surface of earth is sitting pretty around 300 K), the gas rises much the same way a hot-air balloon rises. Thus, for the most part, it is the extreme temperatures that cause the explosion "bubble" to rise in the first place. And it is the convective air currents under the bubble that cause the column to form. Exotic designs of atomic devices have directionality because of interaction with the material surrounding the core. This was documented by George Dyson in his book PROJECT ORION, when he revealed the 'pusher capsule' bombs would have had a filler which turned into plasma and 'pushed' on the plate on the bottom of the spacecraft. However, as seen in the Operation Starfish exoatmospheric explosions, detonations in space are spherical unless the device is specially designed for directionality, and most devices (as per my reading of Chuck Hansen) are not designed for directionality. Not the answer you're looking for? Browse other questions tagged fluid-dynamics explosions or ask your own question. Why do nuclear bombs make a mushroom? Why do nuclear weapons create a blast wave? Why does a lump of explosive burn's with an explosion? What is physics behind of explosion under Atmospheric pressure? Nuclear Explosion Confined by Gravity? How is the temperature of a nuclear explosion determined? 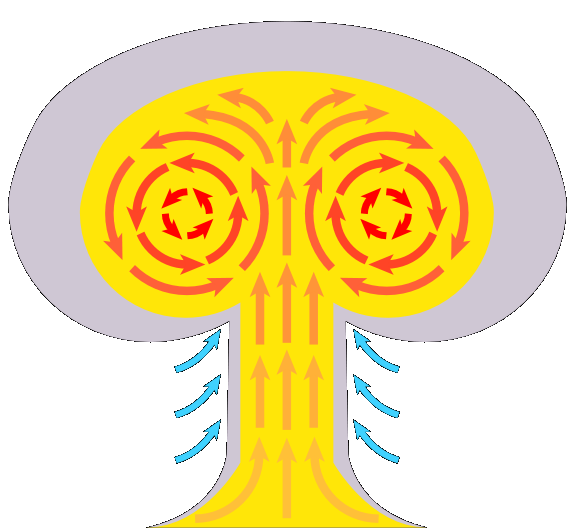 Can an atomic bomb/rocket with nuclear warhead's nuclear explosion be triggered by a conventional explosion close to it?